For years, I heard wonderful things about novels by author Louise Erdrich, who won the National Book Award for The Round House. I was intrigued by descriptions of her latest novel, LaRose, and finally had a chance to enjoy it on audio at the end of the year. I was absolutely entranced by this moving, original novel about families and community. The story takes place in a modern Native American community in North Dakota. In the summer of 1999, Landreaux Iron is out hunting for deer when he mistakenly shoots and kills his neighbor (and friend)’s five-year old son, Dusty. His own five-year old son, LaRose, was Dusty’s best friend, and the two boys often played together. Everyone, in both families, is devastated. Landreaux, who is a recovering alcoholic, is particularly horrified by what he’s done and finally sees a path forward in a sweat lodge vision: to enact an ancient Ojibwe tradition and pay for his mistake in kind. He and his wife, Emmaline, give their son, LaRose, to their neighbors, Peter and Nola, to replace their lost son. Now, both families are full of grief and loss. Little by little, though, LaRose begins to heal them. His new adoptive mother, Nola, suffers from depression, but caring for LaRose seems to help. His new teen sister, Maggie, is thrilled to have him in the house and enlists him to help her keep Nola from her darkest depths. His birth family still misses him horribly, but over time, healing takes place and LaRose himself comes to see what his role should be for both families. This is an incredible novel, full of emotional depth and intricate relationships; I can see why Erdrich is such an acclaimed writer. Most remarkably, this isn’t just a story of these two families but of an entire community. Perspective switches not only among the members of the main two families but also among others in the community: the local priest, Landreaux’s childhood friend who blames him for his misfortunes, Emmaline’s mother (who LaRose is named after), and more. Within the families, we hear from not only the four parents but also Maggie and LaRose’s original siblings. There are even chapters going back to 1839, where we meet the original LaRose and learn of the family’s long history. Erdrich weaves all of these different points of view into one cohesive, moving story that is both about an extraordinary tragedy and its aftermath and also about ordinary life. It is historical fiction, family drama, and coming-of-age stories all rolled into one. I loved every moment listening to this audio book, which is beautifully produced and makes you feel a part of the story. 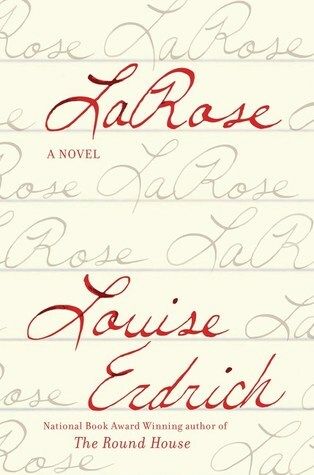 LaRose is incredibly compelling – its characters feel like old friends by the end. Although it starts with a tragedy, it is really about healing and moving forward and life, in all its messy glory. LA ROSE is on my list of books to read in 2017 (or better yet, listen to) and I am more excited for it than ever. I loved ROUNDHOUSE. This sounds just as good. It was wonderful on audio, Anne - an excellent narrator. Now I want to read The Round House, too! Boy this sounds good and also as if it was a difficult read. I'll add it to my list for this year! You're right - it is difficult at times, but the focus is really on healing, so it is mostly positive - the bad stuff happens in the first chapter!